Welcome to the third post in the Top Things by Travelers Around the World series! The topic this week is Top 3Â Modes of Transportation. Being travelers, we all find ourselves taking many different means of transportation depending on where we are and where we’re going. They might be fun, practical, unique, adventurous or… scary! When I posed this question two weeks ago, I never expected I’d get so many amazing answers. Feel like a local by trying their unique vehicles like the tuk tuk in South East Asia, the chicken bus in Central America, or a dog sled ride in the far north.Â There are also transportation modes that gives you great sightseeing experiences like hot air balloons and chairlifts, or more adventurous ones like animal rides, river sledging, cave tubing, and zorbing! Sometimes the best way to get around doesn’t use a vehicle at all, like with your own two feet, or by swimming! Seventeen travelers and their partners have contributed their thoughts to this post and I think the result is a very interesting and entertaining list – so let’s check them out! 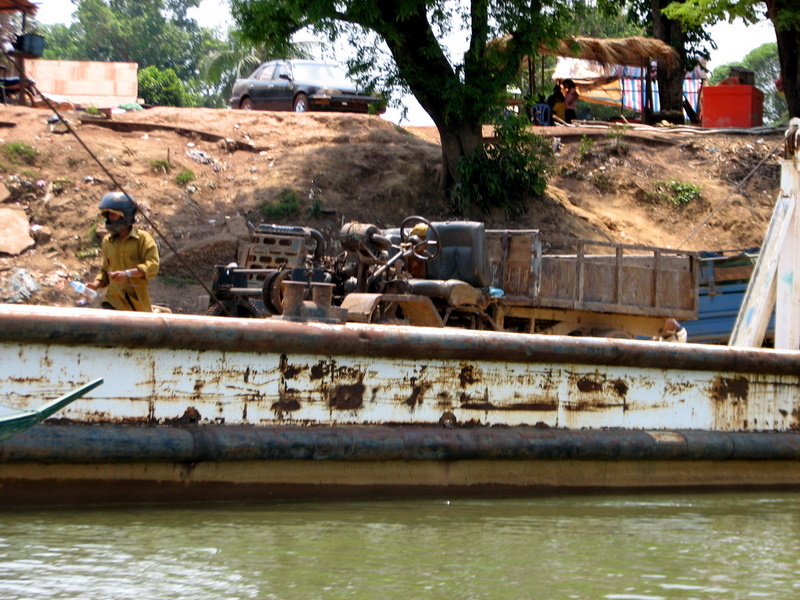 Speed Boat (Laos): I’ll never forget racing down the Mekong at speeds of up to 60 mph in a tiny canoe-sized vessel with four of us passengers forced to sit with our knees digging into each other’s backs for five hours. The ride was so dangerous that before we departed from our starting point, we were all given motorcycle racing helmets to wear. Unfortunately, they didn’t give us earplugs and as a result, I couldn’t hear for about six hours after we arrived due to the impossibly loud and constant roar of the boat’s engine. Open-air Jeep (Pakistan): While the 2-day journey I took standing up in the back of a jeep, packed in with 12 other people and facing daytime temperatures of 40 F (5 C) was somewhat on the painful and challenging side of things, I would do it all over again any time. 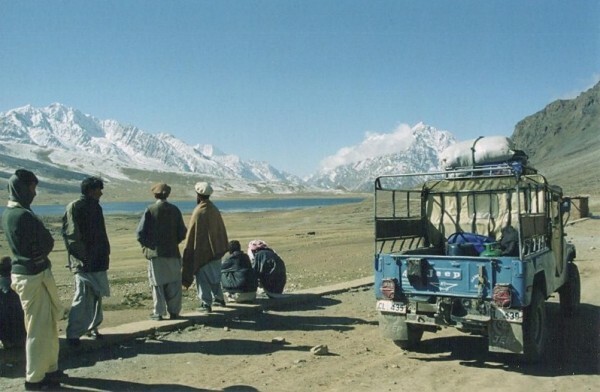 Traveling across the Hindu Kush mountain range in this manner allowed me to reach a region of the world that few people visit and to experience first-hand the most spectacular scenery I have ever witnessed on this planet. My feet: There is nothing more interesting to me than exploring by foot. It’s the only way to discover what lies beyond the outer surface of a destination. It is our feet that can lead us into the narrow lanes, through the sprawling markets and to places that other modes of transport simply can not go! Zorbing - Imagine diving into a plastic ball with water in it and being rolled down a hill, and you have Zorbing. 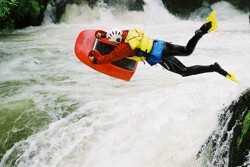 It’s bizarre and fun – and a perfect example of Kiwi ingenuity…or insanity, I’m not sure which! Sledging - As if white-water rafting isn’t exciting enough, sledging is navigating a white-water river on a glorified boogie-board. I did it in New Zealand…and it was one of the most amazing experiences I’ve ever had. You can read about it here. Train - I’ve been a train travel enthusiast most of my life, choosing it consistently as my preferred mode of long-distance travel. I’ve taken the train all over North America, through Thailand, Malaysia, Singapore, and I plan to do a few world-class train rides in Europe, as well as Australia in the coming year. Yippee! Plane from Lima to Cusco. Because of the narrow valley in Cusco, flights are delayed massively if there is morning fog! I waited in the Lima airport for 4h, with 6 planeloads of other people in front of me. Bouncy, sketchy minibus from Cusco to Piscacucho. 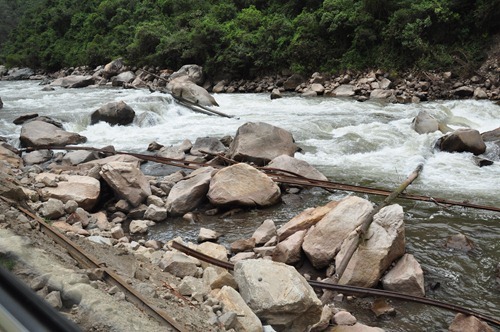 Because flooding washed out the tracks to Machu Picchu (and they’ve only repaired the second half), you have to take this bus to a temporary train station. Two hours of switchbacks, scary overtaking, and very poor rural towns. The most expensive and most scary train ride you’ll ever take: from Piscacucho to Aguas Calientes (“Hot Water”) at the base of Machu Picchu. The picture says it all – I guess that’s the old track, down there in the river. I heard that the day before I arrived, a train had derailed. We passed construction workers every few minutes, still working on the in-use track. Nice! The buses in Spain. Usually cheaper than the trains and even more scenic. Highly recommended! The London underground. I don’t care what Londoners say- the tube is one of the best public transportation systems in the world. Expensive, yes, but worth it. Rent a car in New Zealand. It’s easier to get around and it’s fun (and generally safe) to pick up hitchhikers! Hitchhiking in Namibia- of course there are risks, but it’s possible to have some really fun encounters too including meeting super fascinating people. Chicken Bus (Old American School Buses) – While traveling in Central America, these tricked out buses got us everywhere we wanted to go. It may have taken 3 different buses and all day to get to a place, but we did get there. And we got there in style, with chrome grills, neon interior lights and awesome paint art. Our video best represents the different buses we rode on. Tuk-Tuk – Another backpacker favorite, Tuk-Tuks are best know in SE Asia, but Latin America has them too. While driving around Antigua, Guatemala in Tuk-Tuks, you are sure to almost lose your lunch. The cobblestone roads aren’t the best for a Tuk-Tuk and neither is the rainy season. Regardless, they are fun, easy to catch and cheap. Motor Taxi – Motor Taxis are similar to a Tuk-Tuk, but bigger in size. It’s basically a motorcycle or motor bike with a carriage welded on to the back. We found them near the beaches of Ecuador and they offer a cool ride with the wind in your hair. Mini Moke: This is almost like a Pow-Pow-Power WHEELS! – for adults. We got to drive this lovely little car (with no doors and very little power) during the rainiest dry season Barbados had ever seen. Not only do you get to drive on the left side of the road, but there are no road maps or street signs in Barbados, leaving it a free for all. It is you vs. public transportation on skinny, wet roads. Shinkansen: This awesomely fast train took us from Tokyo to Hiroshima in a little over 4 hours. During the course of the year, this punctual bullet train loses only 2 minutes out of all trains in the entire country. Not only do you get there quickly, but you get to enjoy the small snack carts filled of random Japanese delights while speeding down the track. Double Decker Bus in London: Everybody can ride the tube, but you miss so many of the sights and sounds of London by confining yourself underground. Sure you get extremely drunken people on the bus (everyone has a vomiting on the bus while drunk story), however, it definitely makes for an experience. #1 I definitely have to go with motorcycle/scooter. Â It’s an awesome way to see the sights as you go and have freedom to go wherever you want. #3 Is to combine the #1 and #2. Hitch Hiking in Asia: Though uncommon in Asia, it’s possible! If you think the language barrier is already a task, try catching a ride and you’ll be in more of an adventure. I’ve had to hitch on the back of some sort of animal transportation truck. With the smell of poop and an extremely bumpy ride that nearly took me off the truck, I eventually got to where I needed to go. Motorcycling cross country or across many countries: My favorite. I love to venture off the road into smallÂ neighborhoods. It’s quick yet slow way of traveling. Dune Buggy rides across the desert: In Huacachina, Peru, you can take a tour around the desert and go for some Sandboarding. I had a mad man as a driver that nearly flipped us over. The ride felt like amusement roller-coaster but only it lasts much longer. At incredible speeds zooming up huge hills and not knowing how steep the other side will be, it’s an experience. I was crazy enough to ask the driver if I could drive, he told me I’d probably kill us all if I drove as if he wasn’t trying to do that already. Barefoot. Well, almost barefoot. 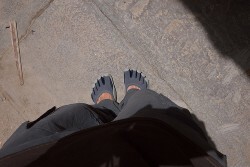 I recently discovered the beauty of walking with Vibram FiveFingers and I really must say, nothing compares! Experiencing the way those cobblestone streets actually feel under your feet just isn’t possible without going barefoot. Or getting a pair of FiveFingers! They keep your feet safe from harmful objects while simultaneously allowing you to feel the ground underneath your feet. Jeep. A 7-person jeep carrying 22 people in India, to be exact. Even the driver hangs out the side of the jeep while reaching across four people to reach the shifter. He drives carefully though, just as you’d expect anyone hanging out of a jeep to drive! Train. It’s practical, cheap, and usually comfortable. The train system in India is one of the largest and busiest in the world, transporting more than 20 million people every day! It’s cheap too! You can go 1,500 miles on less than $50, or buy an unlimited 90-day pass for $225 (foreigners only). Trains in the U.S. – people in the U.S. don’t often think of train travel as a good option like many other countries do but it’s very convenient and there’s something very charming about viewing the countryside from the train (the same countryside that looks boring by car somehow becomes charming from the train). It can also be super economical when you buy a rail pass. 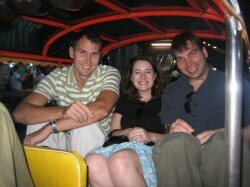 Tuk tuks – fun to say and do. Songtaew - unless you’re 6’4″, in which case, you have to contort your body to fit. Chicken Buses: The conversations on these alone are reason to take chicken buses! This is how the locals travel and Guatemalans are a friendly lot so it’s chatting and practicing your Spanish is a great way to pass a long bus ride. 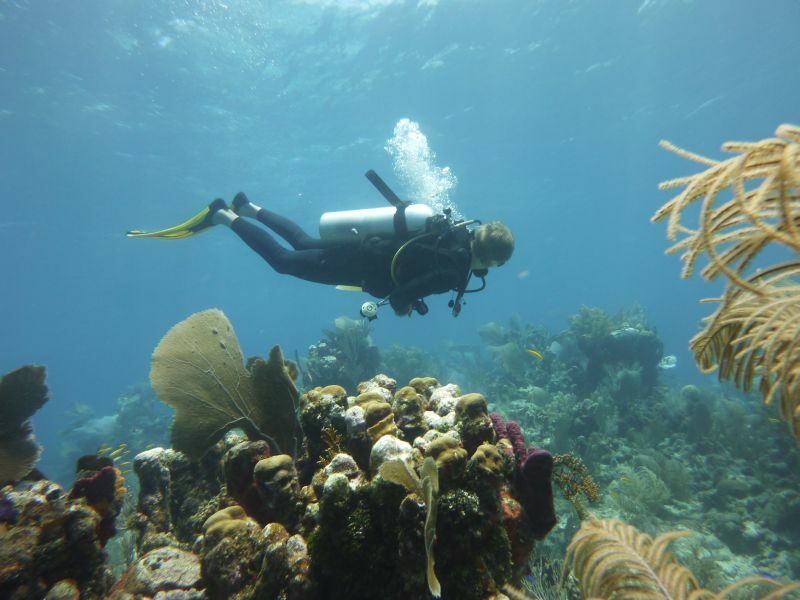 Two Fins and a Mask: Diving and snorkeling are my favorite activities so while not the most traditional way to get across the water I have definitely done long-haul swims between islands just to explore and see the fishies along the way! Bicycle: Exploring the countryside on a bike is a total sensory experience -you can better see and smell the country and it boosts your chances of pulling off on the side of the road and chatting with a local farmer or that group of ragamuffin children digging in the dirt! Three-Wheeled Motorized Cart in Sicily – On my travels thus far, my favorite mode of transport has been a three-wheeled, rickety Italian truck. You will see these cars, if you can all them that, throughout Italy, usually carting around produce in the back. They have two wheels in the rear and one in the front. Most often, a little gray haired man is behind the wheel, smiling while on his way to the local market. I had the chance to ride in the bed of this cart while studying in Sicily. Lost and without direction with a group of friends, an old Sicilian man motioned us to hop in the back of his car and he would take us to our location. Not knowing if 5 of us would hold up in the back of this mode of transport on three wheels, the ride has been one of most memorable times on transportation in Italy. Peddle Boats in Washington D.C. – Traveling your way around historical monuments usually involves a bike, walking, or riding in a car. In Washington D.C., you can peddle boat around the Jefferson Memorial and view the Washington Monument in the distance. This mode of touring is relaxing, minus the bulky orange life vest you have to adorn. 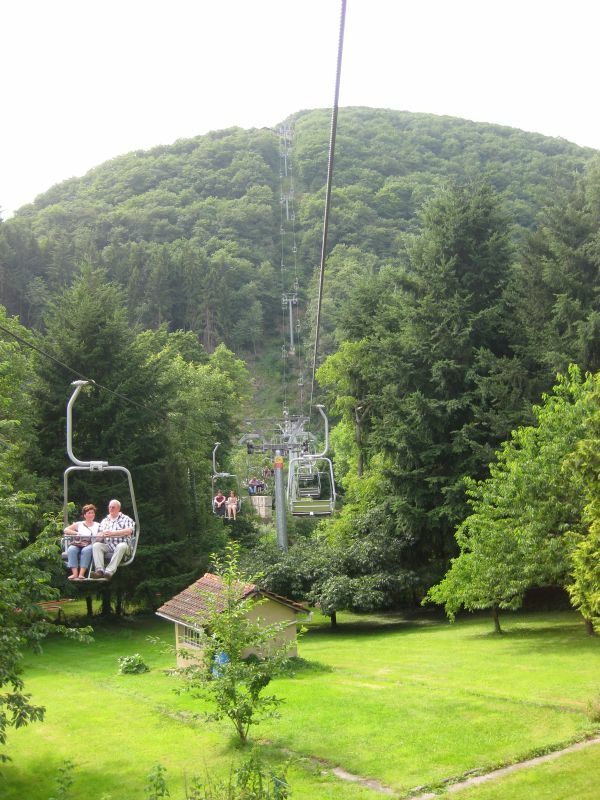 Chairlift to a Luxembourg Castle – While you can reach the Vianden Castle in Luxembourg easily by foot, I thought the only way was by chairlift. You glide two by two above localsâ€™ backyards, weaving through lush greenery, all while admiring the remarkable view of the Vianden Castle. This has been a favorite mode of transportation for the views alone and the silence that comes while going by two-seated chairlift. Funicular - Santiago, Chile has a few high hills in the middle of the city, but the most famous is Cerro San CristÃ³bel. It’s 880 meters high and has a statue of the Virgin Mary on top. As I didn’t want to climb it, I took the easy way out and took a cable car to the top. On the way down, I took the historic funicular, which is a narrow gauge train. It looks like an amusement ride because it’s small, but the trip down was very steep. Unlike an amusement ride in the US, there were no seat belts. Sailboat - This isn’t very unique but it’s the most relaxing way to move. Well, as long as someone else is doing the sailing! Combine a sailboat with a beautiful sunny day in the US Virgin Islands, a dog for a first mate, and a few stops to snorkel, and I can’t think of a much better way to spend an afternoon. Blimp - You’ve probably seen a blimp, but I bet you haven’t been inside one. It’s a long story, but I got to ride in one due to my involvement in a political campaign. 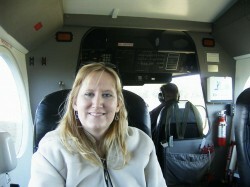 Once we got about 1,000 feet above Tampa, Florida, they even let me steer! (Shhh, don’t tell anyone). It’s not easy to pilot a blimp because there is a lot of wind resistance and no power steering. Cargo Freighters.Â Since my trip was a RTW trip with no airplanes, I had to figure a way across the oceans I have to traverse. Freighters were the best way, though they are expensive and quite boring. Bring books and video – it takes 17-20 days to cross the Pacific. 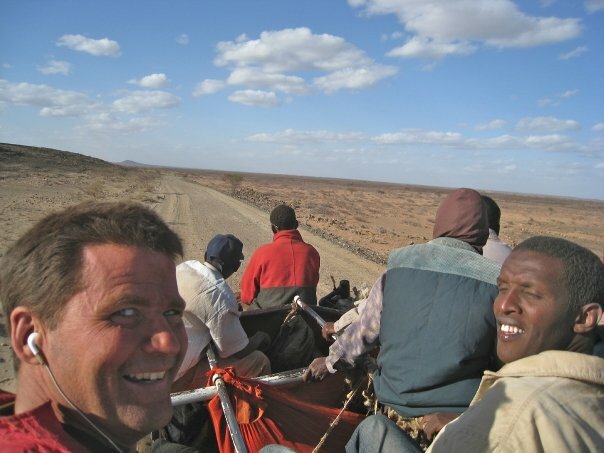 On TOP of a three ton lorry in Ethiopia.Â If you are going overland from Nairobi to Addis Ababa, there is no means of public transport, so you have to hitch a ride on a cargo truck, with the locals.Â And everyone rides up top.Â On metal bars. By mule in Peru.Â This one is kinda lame on my part. The deepest canyon in the world is Colca Canyon in Peru (twice as deep as the Grand Canyon).Â I hiked down on a guided trip, spent the night at the bottom, and chickened out on climbing back up and took the “taxi,” otherwise know as Raul, the friendly mule. When I was Egypt in 2004 I rode both a camel and a donkey. Neither was very comfortable, and I hope that I never have to ride either again. The camel handlers, being funny, would get the camel racing as the rider (which was me) hung on for dear life. You never want to fall off! In Asia one of the favorite modes of transportation of course is the motorcycle. Here in Korea they rule the sidewalk. In Taiwan and Thailand the entire family rides together. My favorite ride ever was in a hot air balloon over the ancient city of Bagan. Watching the sunrise over the temples is about as good as it gets! Subways – It may be because I grew up/live in a subway-free area, but I am still amazed by their efficiency! Â I never tire of riding them around a new city, or studying the system map. Â My favorite, thus far, is the Paris metro system. Â Traveling there was my first big international trip – I will never forget the feeling of exiting the OdÃ©on metro station for the first time, and getting that “oh my, I’m in Paris!” feeling. Â Plus, the art in metro stations is always awesome! Vaporetto – I never stepped on a gondola in Venice, but the vaporetto was my best friend. Â I was completely taken in by the concept of a “bus” boat. Â Taking route 1 up and down the Grand Canal is a fun (and cheap!) tour of the city, and I recommend it to everyone. Â I rode them so much I felt like I was still on water when I was walking around on land! Walking – This is, by far, my favorite mode of transportation. Â I usually walk so much when traveling that my feet hurt 24 hours a day, but this is the best way to experience a city, so well worth it. Â Even if I am only in a new place for a couple of days, walking lets me discover way more than driving around would – and there is always something interesting to stumble upon when wandering from one spot to another. Cave Tubing - Tubing down the underground river in Waitomo Glowworm Caves, New Zealand was one of the best adventure we’ve ever had! It involves floating in the underground calm water, rushing down the rapids, going over the underground water falls, crawling through narrow passages, and walking through shallow and uneven river. It’s a perfect way to enjoy the beauty of glowworms and the cave formations. Left: Donkey ride in Santorini. Centre: Cave tubing in Waitomo Glowworm Cave, NZ (Â© www.waitomo.com). Right: Becak-man sleeping in his becak, waiting for a passenger. So… What you think about these modes of transportation? Have you ridden them yourself? Any other unique ones you want to share? Did we miss your favourite? Post a comment now! Topic: Top 3 Temples and Other Religious/Spiritual Structure! What are your favourite 3 temples or other religious/spiritual structures and why? This could be any structures dedicated to any spiritual/religious beliefs such as Buddhist temples, ancient Greek temple ruins, Mayan/Incas temples, Mosques, Hindu temples, shrines, churches, Cathedrals, Basilicas, even just a statue on the beach! As usual, a little explanation of each is encouraged even though it could be without. Photos are more than welcome! (We might collage/pick one if you send more than 1 picture). Submission deadline: Sunday, June 20th, 2010, 9 a.m. EST. That’s about 2 weeks from this post date. This list gets just as interesting each week. LOL @ Pow-Pow-Power WHEELS! .-= Michael´s last blog ..5 songs that should be on your traveling playlist =-. .-= Nancie (Ladyexpat)´s last blog ..Rolling the Omelet =-. Btw, those camel rides, when I was in one in Egypt, I thought I was going to fall when the camel standing up or bending down! The movement was quite violent, and there was only a little thing to hold on. Same as yours? Brilliant post – I’m laughing at some of these stories! Particularly like the Chicken Bus!! I generally stick to a motorbike when I’m travelling, the next best experience was on a unicycle – it was much harder work but certainly encouraged conversation among everyone I met! Unicycle? Wow!!! I can imagine a lot of new friends you make with that! How far could you go with that? I always look forward to this series! So many interesting responses! Thank you for including mine! When you asked me for my three favorite modes of transportation, I honestly had a hard time thinking of three modes! I never could have imagined all these responses. So awesome! .-= Raam Dev´s last blog ..Sustainable Distribution of Abundance or Why I Donâ€™t Haggle in the Third World =-. Thanks, Raam! I hope someday I could ride on a jeep with the driver not actually being inside the vehicle I have seen people riding outside vehicle dangerously (even in Lisbon, to avoid paying), but I have never seen the driver not inside! This is a really fun series. I haven’t heard of many of these types of transportation like zorbing and songtaew. 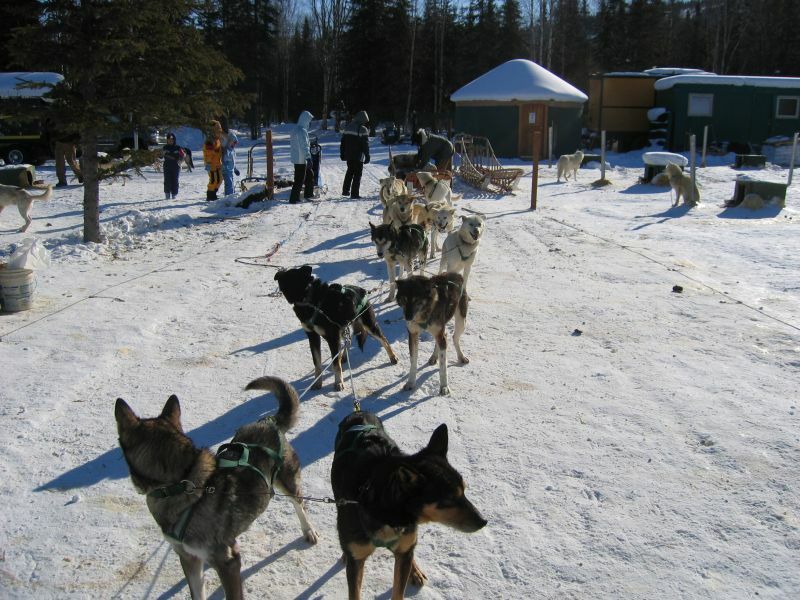 I really want to try dog sledding now! .-= Jennifer Barry´s last blog ..Chile: Land of Contrasts =-. And so many people want to have the opportunity to ride on a blimp! Lucky you! I would have never ridden on a blimp if it wasn’t for my husband. He’s been a little bit obsessed with them since childhood, so he wasn’t going to let any chance go by! .-= Jennifer Barry´s last blog ..Return to Oz, Part 4 =-. .-= Eli´s last blog ..Weekend Update: 6/5/2010 =-. This series was such a great idea, Dina! And I’m super jealous of Nora and zorbing – I’ve always wanted to try it. And sooo looking forward to the next one. It’s going to be hard for me to choose just 3 religious structures that I love. .-= Ashley´s last blog ..Travel Memories Monday – Delta, Utah =-. Nora is a super adventurous girl! Check out her sites to see more of her wild adventures, so much fun to read. Her river sledging sounds quite crazy! I like your vaporetto idea, even though I want to try goondola too (people said it’s expensive though, gondola? Agree with you in Paris metro – so convenient! Yeah, the gondolas were expensive…I think around 100 euros. They did have little gondolas that were just cross the canal where there wasn’t a bridge. Those were cheap cause they were all used by locals, but everyone stood, and that was too intimidating for me – I’d be the one that fell off! Thanks for asking me to contribute. I love these posts. It’s so fun to read all of the responses. .-= Shannon´s last blog ..Vacation Fairy can add some extra magic =-. Now that I’m in NZ, zorbing sounds a bit scarier because I can actually find one. Thanks for you awesome answer, some people here including me are curious about the SongTaew. Good thing Ryan is 6’2″, hope he fit! Oh, this is great, great stuff, a lot of modes of transportation I’ve never heard of. Nora’s adventures in New Zealand sound particularly interesting/frightening/thrilling. This series is a great idea, Dina. I’m learning a lot. I’ll be participating again soon….. Thanks Sabina! Nora is very adventurous indeed! Brave girl!! The river sledging looks wild. We will be happy to have you in the post again!! .-= Dave´s last blog ..Down the Barrel of an Active Volcano =-. Dave, that’s the problem. Even my tiny waterproof camera, they didn’t allow me to carry. They said it’s safety consideration. Since we are jumping and flailing, the camera could hurt somebody, they said. I don’t know my camera will do any good in the darkness like that, but wish I could try! I have to agree with Ashley, this series was such a great idea!! .-= Cris Campos´s last blog ..South Thailand in a 3rd class train =-. At least this post lets me know what to look forward to – or a general heads up! Its super exciting to read about the millions of different ways to get around. I’m kinda looking forward to the dune buggy. We used to go sandboarding alot when I was a kid at White Sands. .-= Erica´s last blog ..Workinâ€™ Hard for the Money =-. Thanks Erica! Glad that you joined in the post too. I like the idea of Mini Moke in Barbados. When I was there, we hired a car (just regular car) with the driver, not as fun as a Mini Moke could be! Burning fuel is for the lazy. …cover 99% of the planet without destroying the planet. Hey Andrew, nice perspective! I just checked your blog, and wow, a great zero fuel burning mission you have there! The big trip will start on August? I guess I still can’t leave the fuel burning life, but I can say that I have much more walking than riding on a car/bus nowadays to cover a short distance, as we do this big traveling, than in my previous stages of life. I believe this will get carried on in my future. Great post!!! Sledging is maybe the one adventure sport I have yet to do. I think that might be the next thing I take up… it looks amazing!!! .-= Brendan van Son´s last blog ..Why I Travel: A Life Travel Story by Brendan van Son =-. Thank you Brendan River sledging looks wild indeed! .-= JR Riel´s last blog ..3 Steps to Squashing “On the Road” Loneliness =-. I was glad to see ‘walking’ included a few times. It will always remain my transportation mode of choice. .-= Earl´s last blog ..How Religion Can Help Keep Your Backpack Safe =-. To be honest I forgot about how important walking is, until I got your answers. But you are so right! Exploring by walking is one of the best way to experience. Either it is in a city or in a forest trail. Allows us to get much closer look to where we are, and we have time to absorb the experience more because we are slow moving. By walking, we encountered and saw so many things that we wouldn’t otherwise. Love all of the creative and fun answers here – this also works as a great list of “what to dos” in some of these countries Thanks for including me this week! What a great roundup, and I’m glad people like the zorbing and sledging! I must say I’ve done a lot of adventurous things in my life (competitive skydiving, motorcycle racing, mountaineering, etc), and sledging is right up there for me. And Dina – don’t worry about the zorbing – it’s much more fun than scary! You make me speechless, Nora! I love gondola rides, even though I am borderline afraid of heights. Our most recent trip on one was in Stowe, Vermont- where unfortunately it decided to stop suddenly at its highest point and remain stuck for a few minutes. It didn’t help my case as I convinced my wife (who really is afraid of heights) that it would be fun and perfectly safe. It started again and we made it up just fine. It was definitely worth it as the views were great. .-= Jay´s last blog ..Free Museum Weekends =-. Hi Dina, I just wanted you to know I posted a link to this on my blog. Wow Jen, thanks so much! You are so kind! What memories….from an old traveler. In Cairo in the 60’s on a camel the driver asked for a tip..covered in the cost. I said no. He had spotted my “boyfriend”… a fellow traveler I was “with” and said he would ask him. I said no. Was told if I didn’t give him a tip he would hit the camel and send me out to the desert! Guess what? I gave him a tip!! Love trains. Had a great trip from L.A. to Seattle (recently)and met heaps of great people. VERY slow! Got off in Portland at 7pm…fortunately as would have missed the mountains…was going to walk across bridge but thought better of it and took taxi. Good move! Arrived Seattle where my son lived, got bus and bus driver lent me her phone to ring son as mine didn’t work in U.S. Lady getting off, having heard my chat to son said..”tell your son to take you to the Kangaroo and Kiwi”!(pub). I did. He did! I am a Kiwi! Those camel guides could be very annoying indeed with the little extras they want! They almost didn’t give us our camera back, but the threat you and your “boyfriend” got was much more annoying!! I probably won’t take a chance either. We happened to have a tour guide that cleared up the baksish mess. 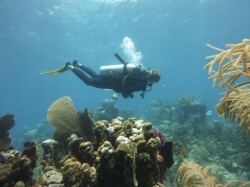 I’m with Shannon on fins! Good and fun roundup. I want to add pedicad in the Philippines where it’s like a tuktuk but with pedalled bike instead of motor. .-= Lilliane´s last blog ..BALI bumming =-. I’ve been away and haven’t been able to read this post- but it came out great! Thanks for asking me to participate! .-= Mary R´s last blog ..Falling Down the Rabbit Hole =-. Hey Mary, thanks for participating for the previous one I’ll let you know if we have more in the series! I love going by foot whenever I can. The 1500 mile walk I did across Finland in 2003 was one of the most amazing experiences I’ve ever had.